Researchers have revealed that chimpanzees are not only capable of learning from one another, but also use this social information to form and maintain local traditions. A research collaboration between the Gonzaga University and the Max Planck Institute shows that the way in which chimpanzees groom each other depends on the community to which they belong. Specifically, it is the unique handclasp grooming behaviour that reveals this local difference. 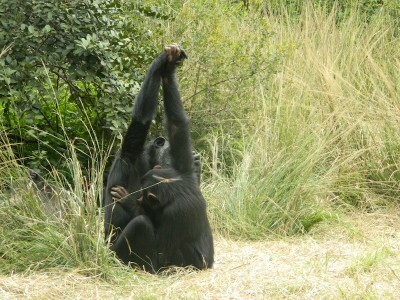 The specific behaviour that the researchers focused on was the 'grooming handclasp', a behaviour where two chimpanzees clasp onto each other's arms, raise those arms up in the air, and groom each other with their free arm. This behaviour has only been observed in some chimpanzee populations. The question remained whether chimpanzees are instinctively inclined to engage in grooming handclasp behaviour, or whether they learn this behaviour from each other and pass it on to subsequent generations. Edwin van Leeuwen and Katherine Cronin of the Comparative Cognitive Anthropology research group of the Max Planck Institute for Psycholinguistics led by Daniel Haun conducted their observations between 2007 and 2012 at the Chimfunshi Wildlife Orphanage Trust in Zambia. At Chimfunshi, a mix of wild- and captive-born chimpanzees live in woodlands in some of the largest enclosures in the world. The Max Planck team collaborated with students from Gonzaga University led by Mark Bodamer, a team of local chimpanzee caretakers, and Roger Mundry of the Max Planck Institute for Evolutionary Anthropology in order to collect and comprehend the detailed chimpanzee data. Previous research suggested that the grooming handclasp might be a cultural phenomenon, just like humans across cultures engage in different ways of greeting each other. However, these suggestions were primarily based on observations that some chimpanzee communities handclasp and others don't – not whether there are differences between communities that engage in handclasping. Moreover, the early observations could have been explained by differences in genetic and/or ecological factors between the chimpanzee communities, which precluded the interpretation that the chimpanzees were exhibiting 'cultural' differences. The present research shows that even between chimpanzee communities that engage in the grooming handclasp, subtle yet stable differences exist in the styles that they prefer: one chimpanzee group highly preferred the style where they would grasp each other's hands during the grooming, while another group engaged much more in a style where they would fold their wrists around each other's wrists. "We don't know what mechanisms account for these differences", van Leeuwen says. "But our study at least reveals that these chimpanzee communities formed and maintained their own local grooming traditions over the last 5 years. Our observations may also indicate that chimpanzees can overcome their innate predispositions, potentially allowing them to manipulate their environment based on social constructs rather than on mere instincts." Apart from the different style preferences of the chimpanzee communities, the research team also observed that the grooming handclasp behaviour was a long-lasting part of the chimpanzees' behavioural repertoire: the behaviour was even transmitted to the next generation of potential handclaspers. "By following the chimpanzees over time, we were able to show that 20 young chimpanzees gradually developed the handclasp behaviour over the course of the five-year study. The first handclasps by young individuals were mostly in partnership with their mothers. These observations support the conclusion that these chimpanzees socially learn their local tradition, and that this might be evidence of social culture", Bodamer explains. "Continued monitoring of these groups of chimpanzees will shed light on the question of how these group-traditions are maintained over time and potentially even why the chimpanzees like to raise their arms up in the air during social grooming in the first place", van Leeuwen adds.